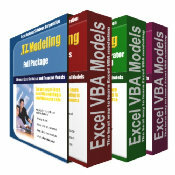 Finance and Statistics Models Set (Set 1) contains different topics in finance and statistics from simple model such as computing standard deviation and mean to more advanced models such as Monte Carlo simulation, multivariate standard normail distribution, multiple regression, and option pricing models. Random Numbers Generator and Statistics Set (Set 2) provides 12 random numbers generators that allow you to generate histogram from the probability distribution given the parameters you have specified. You also have the option to output random numbers from the distribution on the spreadsheet. Numerical Searching Methods and Option Pricing Set (Set 3) contains topics in applying different numerical searching methods to solve mathematical equations and implied volatility from option pricing models. It also includes vanilla option pricing models on future, currency (foreign exchange), stock index, and stock that pays a known dividend. A saving of over 30%! Each of the 37 programs is self contained and ready to run. Users can learn from the source codes. Instant download! * Two programs in this set also available in Set 3. * Two programs in this set also available in Set 1. All for only $29.95 per set. Get the combo pack (Set 1, 2,and 3) for only $59.95. An introduction on the model plus explaination on the key points on how VBA code is applied. Many customized (user-defined) functions available. Unprotected open source code. Learn from the code - the best way to learn. Screen captured from module in the Monte Carlo Simulation example in package set 1. Copyright (c) 2005-2006. EBSIC. All Rights Reserved.